Botrytis is a depressingly common fungus that affects a wide range of plants, particularly in the spring and autumn, since it thrives best in cool, damp conditions that tend to occur at these times of year. Also known as grey mould after the characteristic fluffy growth that appears on the surface of affected plants, botrytis is one of the most recognisable fungal infections, and one of the most difficult to deal with once it has managed to get a hold. Early recognition of the signs of infection is the key to preventing too much damage from being done, but clearly the best method of control is avoiding infection in the first place. Of course, no matter how hard you try, you cannot always guarantee success, but there are a few simple precautions you can take which can certainly help to tilt the odds in your favour. Good management is the best weapon against botrytis – and the trick is to avoid providing the conditions which suit it best and allow it to spread. The fungus does well in cool, damp and poorly ventilated environments, so ensuring that the soil is free draining allowing good air movement will be big steps towards reducing the risk for your plants. Over watering and overcrowding also favour the fungus, so water carefully, especially at the times of the year when botrytis is most likely, and space out your plants to cut down on the chance of cross-infection. Things are a little easier if you are growing plants in a greenhouse, since you aren’t quite so much at the mercy of the weather and the environment is a lot easier to control; try to aim for an atmosphere that is slightly on the dry side. If, despite all your efforts, you are unfortunate to see signs of botrytis, it’s important to remove damaged plant material thoroughly and burn it to prevent re-infection and any shelves, staging or other hard surfaces will need a regular cleaning with a suitable disinfectant. In the greenhouse, make sure to reduce any chance of condensation as best as you can and maximise the air flow to limit the spread of the fungus. Botrytis enters through any damaged parts of the plant, affecting the leaves, stems, flowers and fruits. 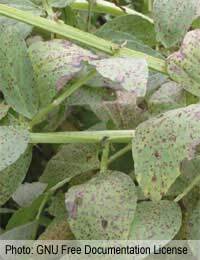 The first sign of infection is usually the immediate area turning brown and rotten, with grey fluffy mould subsequently forming over the plant surface. This fuzzy growth appears particularly quickly in damp conditions, spreading rapidly over the plant or fruit. A humid environment also favours spore production and large numbers are produced which can spread the infection rapidly – hence the importance of keeping the surroundings well ventilated and slightly dry wherever possible. Although some of the commonly available fungicides will give a measure of protection against botrytis, according to the Royal Horticultural Society, there are none available for amateur use which are designed specifically to control this mould. From a practical point of view, the lack of a ready-made chemical solution simply reinforces the importance of good management and preventative measures in dealing with one of the most common and potentially damaging of fungal problems in the garden. Whichever way you look at it, avoiding botrytis is a much better approach than trying to eradicate it once it’s got itself established.